World's Largest Gummy Worm: We've got the largest selection. The World's Largest Gummy Worm is 128 times more massive than a traditional gummy worm. 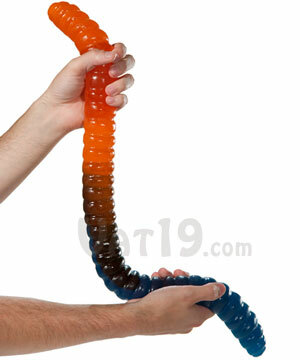 Measuring twenty-six inches long and weighing in at approximately 3 pounds, the World's Largest Gummy Worm is the most delicious 4,000-calorie candy worm in existence. 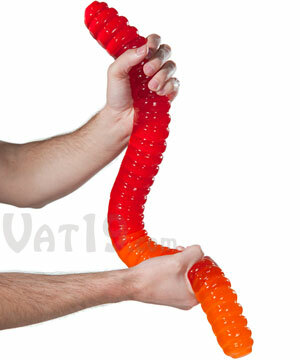 Each World's Largest Gummy Worm features dual flavors, a ribbed body, and a five inch girth. 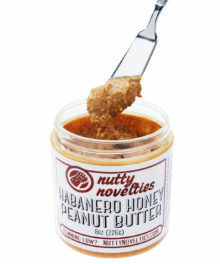 It makes an amazing gift for now or later due to its year-long shelf life. Handmade in the USA. Available in seven flavor combinations. 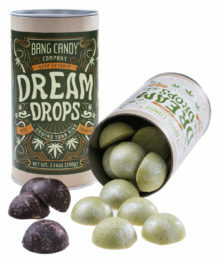 Now available in Sour! Please note that food items cannot be returned. Gummy Worms are delicious. But they're small. 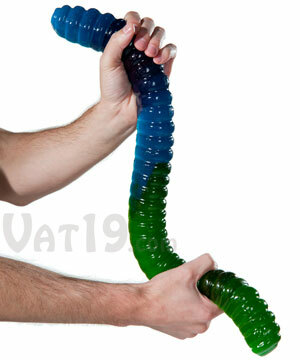 When you really need to get your gummy worm "fix", there is no substitute for the World's Largest Gummy Worm. 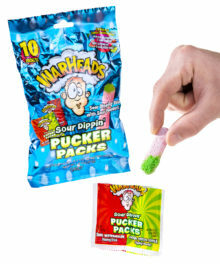 Weighing in at three pounds, it is 128 times bigger than a traditional gummy worm. BAM! The World's Largest Gummy Worm is yours to be devoured. We're not kidding. It's huge. 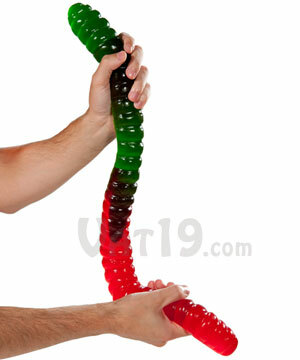 The World's Largest Gummy Worm boasts an impressive 5-inch girth and packs a walloping 4,000 calories into its 26-inch-long frame. Dang. 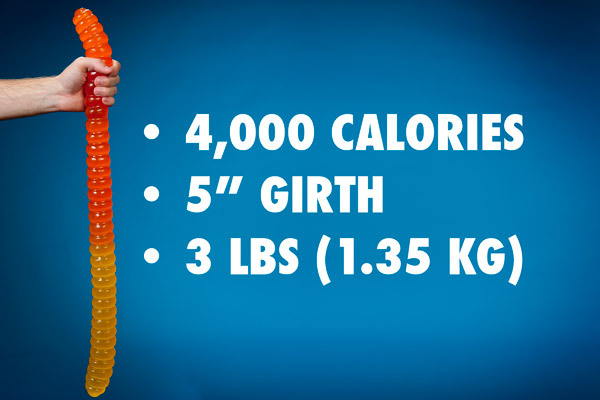 The World's Largest Gummy Worm packs 4,000 calories into its 3-pound body. As I'm sure you'll remember from geometry class, the volume of a cylinder is represented as πr2h. With a radius of approximately 0.75 inches and a height of 26 inches, the World's Largest Gummy Worm is 46 cubic inches of candy. Blend that down and you've got yourself a 0.75 liter gummy shake. Sugary! Its mass is equivalent to approximately 128 regular gummy worms or 840 regular gummy bears. A regular gummy worm is approximately 128 times smaller than the World's Largest Gummy Worm. Which method you employ depends on your mood and how highfalutin you're feeling. If you're hosting visiting royalty, we suggest your finest silver platter and sharpest carving knife. 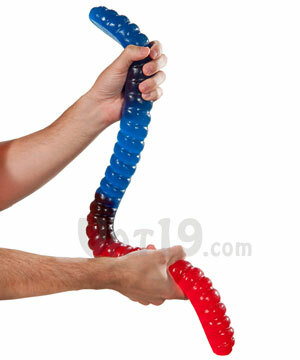 Keep in mind that the World's Largest Gummy Worm has a shelf life of approximately one year, so there's no rush to devour the entire worm in one sitting. The worm's ribbing acts as a perfect slicing guide for large group sharing. The World's Largest Gummy Worm, like its smaller cousin, features a ribbed body and a cute little smiley face. We suppose it's important to know if you're snacking on the head or the tail. 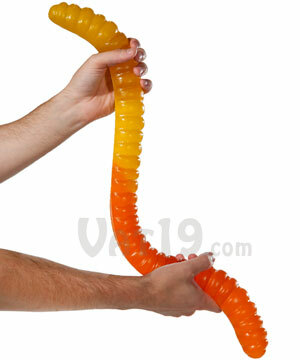 The World's Largest Gummy Worm features the same details (albeit on a grander scale) as a regular gummy worm. A dirt cake may sound unappetizing, but it's actually quite the opposite. 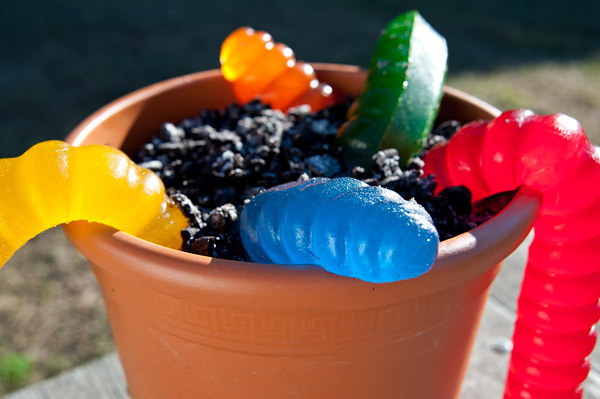 Here are the ingredients: chocolate pudding, crushed Oreos, and gummy worms. Soooo good. With the WLGW, you can create a monstrous dirt cake capable of feeding a small army. We're not going to sugarcoat this: The World's Largest Gummy Worm is not very good for you—unless you suffer from a disease whose only cure is three pounds of delectable gummy. Like any delicious dessert, simply enjoy the worm in moderation. It has a shelf life of over a year, so there's no rush. Below is a table of nutritional information to confirm that the World's Largest Gummy Worm is, in fact, not as healthy as 3 pounds of veggies. Corn Syrup, Sugar, Water, Gelatin, Artificial & Natural Flavors, Pectin, Vegetable Oil, Soybean Oil, Carnauba Wax, Lecithin from Soybeans, Coconut Oil, Palm Oil, Rosemary Extract. 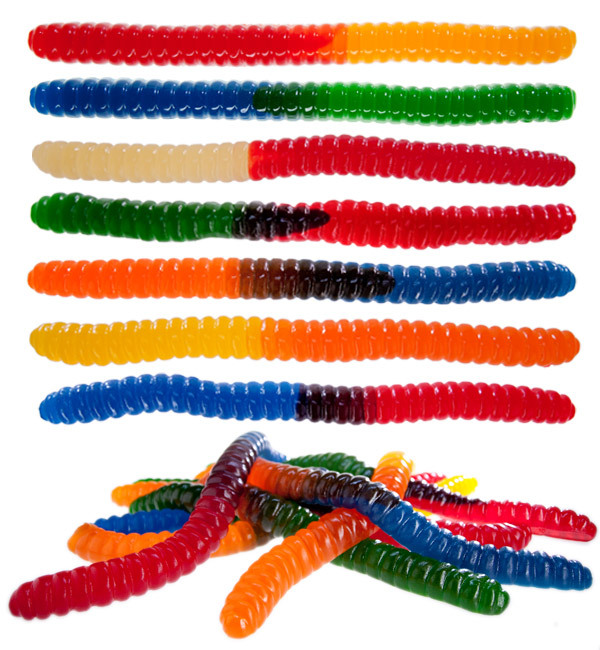 The World's Largest Gummy Worm is available in seven delicious flavor combinations. Question: If you cut the worm in half, will it form two new worms? Answer: No, but that would be awesome. 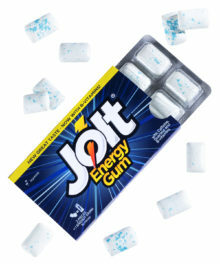 Question: Is this product for real? Answer: YES! 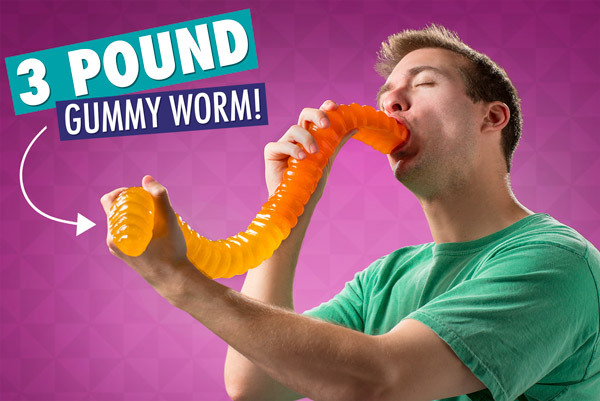 The World's Largest Gummy Worm is 100% real. It is made in the USA and we have a warehouse full of them ready to send to you. In fact, we also have Giant Gummy Bears on a Stick, the World's Largest Gummy Bear, and Gummy Shot Glasses. Answer: The World's Largest Gummy Worm has a shelf life of approximately one year. We suggest keeping it out of direct sunlight and excessive heat. Question: If I froze it with liquid introgen and dropped it, what would happen? Answer: Excellent question! Check out the videos below for the answer to this question (and many more!). Question: This isn't enough gummy. I need bigger! 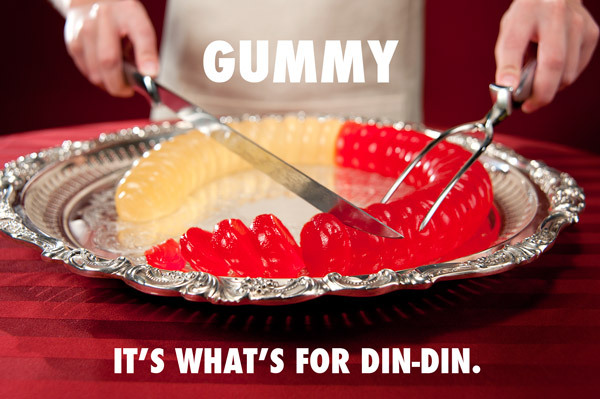 Answer: You can check out our World's Largest Gummy Bear or you can purchase several worms (hint, hint). Question: Is it kosher? Vegan? Gluten-free? Answer: No, it is not kosher. No, the gelatin is derived from a pork source. Yes, it is gluten-free! Answer: Each worm is packaged inside a food-safe and heat-sealed plastic bag. This bag is placed inside a food-safe white cardboard container. The cardboard container is then put inside another cardboard box when we ship it to your house. Question: If I bought 128 World's Largest Gummy Worms, how big would that be? Answer: We're so glad you asked! 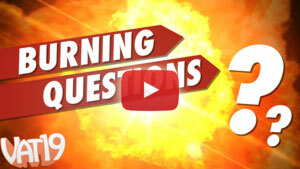 Check out the video below for the answers.